Hong Kong in the mid-19th century was already an international trading port, the door of Southern China and a hugely important shipping hub in the Far East. Hong Kong in the mid-19th century was already an international trading port and home to branches of many foreign companies and banks. This picture shows the waterfront to the west of Pedder Street, Central in the 1870s, lined with foreign trading companies. 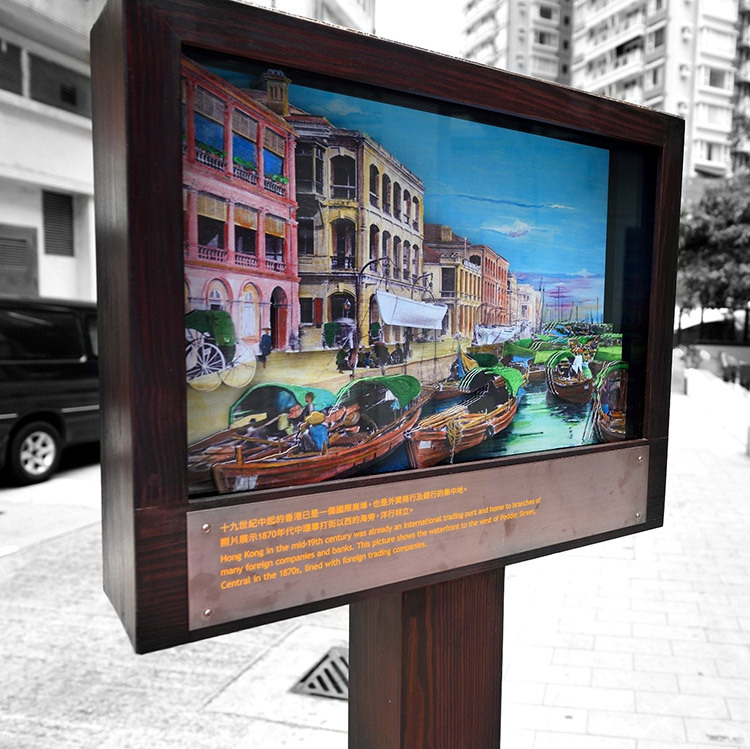 Hong Kong was already a metropolis with Chinese and foreign residents living side by side when Dr Sun Yat-sen first arrived here, with a large number of Chinese and Western shops. This picture shows Queen’s Road West in Sai Ying Pun in the 1910s, a typical Chinese community at that time. From the mid-19th century onwards, Hong Kong became the door of Southern China and a hugely important shipping hub in the Far East, forming a global transportation network. This picture shows the Central harbour view in the 1870s, with many vessels berthed in the harbour. The old pictures of the streets of Central a hundred years ago depict the social landscape of Hong Kong in the late 19th century. During the creative process, I specially added colours to the black-and-white fotomo photos in an attempt to restore the scenes of the old days and displayed them in a 3-dimensional relief. I want to give the viewers a sense of being there in the era of Dr Sun Yat-sen during the 19th century.